I got a new e string and my bridge has a thing on it which I'm assuming is an e string bridge protector? The string seems to also have this on it. I wasn't able to take off this thing from the e string because it won't pull off. Is it ok to put it on the existing protector since I can't really seem to get either off without messing something up? Will it affect sound? 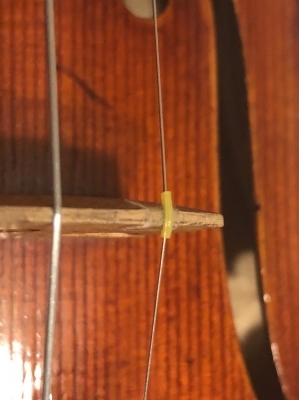 Most E strings have the little protector. I also have the E string protector in my Rudoulf Doetsch bridge. It is not in the bridge of my violins of lesser quality. On my Rudoulf, both the bridge protector and the E string protector are being used. Mine, Pirastro Obligato Strings, would not come off the Gold E string option I used with my string set. When I got my violin, it came with Dominants, and they werw installed with the E string protector and the permanent E string bridge protector. You will want it there if you ever get strings that do not cime with it. If you knick the bridge, that knick could, and probably would, cut into the string. The bridge could be damaged by an E string without the protector on it. If you try to remove it and are not successful, that little protector will most likely be damaged and have a little knick that will cut into that delicate E string. Note to anyone, of you find any factual fault in what I have stated, please correct. Hi @BobbyFlay and others. You are taking a belt and braces approach here. The bridge parchment paper is all that is necessary. I generally let the string sleeve loose on the after length. But no harm is done by your arrangement. Most violin bridges have a protective piece of parchment under the E string. The bridge protector on the string is there in case your bridge doesn't have one. I put the tube on the bridge anyway, mostly so that it isn't loose to buzz on the string afterlength. Also, as long as you have parchment on your bridge, don't worry about damaging the bridge protector, it's too soft to cut the string. I've played with a torn bridge protector for as long as three months, until the string went dull and needed replacement anyway. As far as I could tell, the string was not damaged. Thanks guys I think I'm just going to slide it out of the way for now and then cut it off one of these days when I'm well rested lol. @BobbyFlay and others. I have no empirical evidence as yet to support this, but the mass of the plastic sleeve is so slight as to give little concern about buzz when positioned on the after length portion of the string. Literally millions of such sleeve so exist through out the world. One is reminded of the pebble under the princess’ mattress on this regard. Over the after length is perfect. Also, usually you have to push it hard to get it over the winding which definitely doesn't buzz afterwards. Not necessary to cut it off. We do it for esthetics.